Locking bank bag made of durablock with built-in lock stores, transports and protects coins, currency and documents. UltimaSeven, Locking Security Bag with 7-pin lock provides maximum security for contents; double-stitched seams withstand deposit drops. Our exclusive, durable, laminated 600-denier polyester fabric, DuraBlock, features water-resistant polyvinyl coating laminated to a cotton twill backing. Versatile, rigid fabric provides years of superior performance. 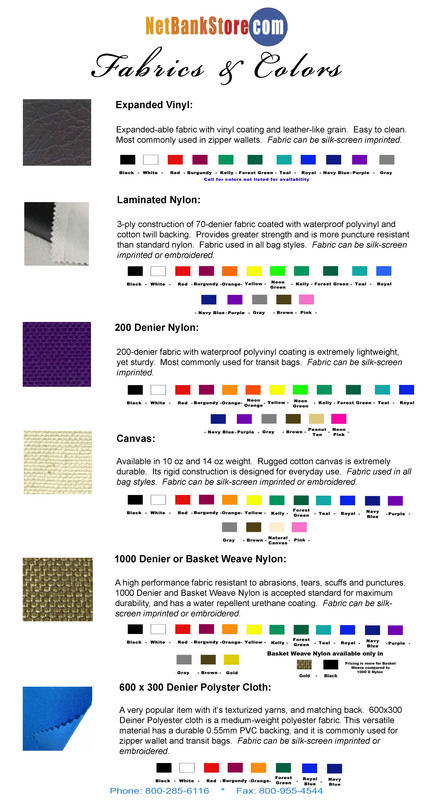 Fabric can be silk-screen imprinted or embroidered.